To understand the meticulousness of Carlo D'Alessio's painting process, one need only look at his most recent work "Hot Stuff." An intense volume of fire bursts forth from a dark background, flames throbbing outwards to emit a palpable heat until the viewer realizes they are not looking at a hearth, but a canvas. His work showcases the kind of hyperrealism that only those with impeccable patience can truly possess. Unlike snowflakes, one egg looks pretty much like another egg. But for Carlo D’Alessio, every day must be Easter, when eggs assume individuality - donning shades of multiple colors, as well as speckles/blotches of varying design. 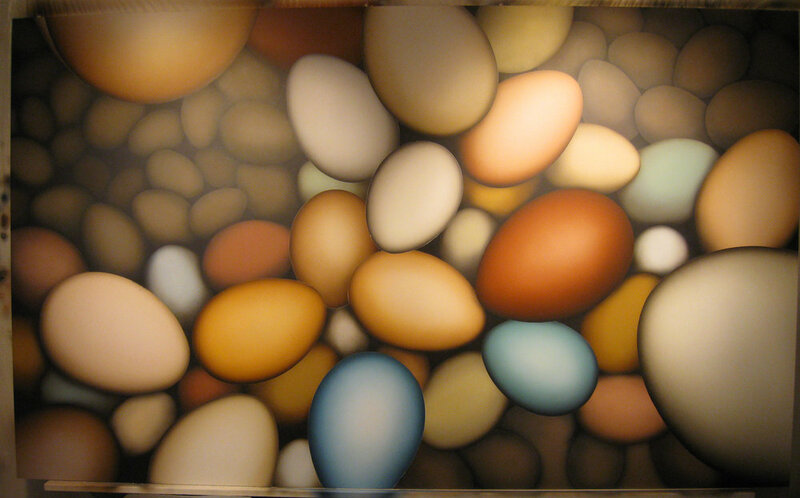 D’Alessio’s 48 x 80“ study of eggs is part of his current exhibition at Michael H. Lord Gallery in the Uptown Design District of Palm Springs. It and two other works reveal a closer-to-Earth perspective than D’Alessio’s surreal and cosmic acrylic-on-board paintings that have been shown at the gallery since it moved to California in 2008. Carlo D'Alessio blends precision with dreamy qualities. Carlo D'Alessio will unveil a new masterwork inspired by the skies of Lake Tahoe, "Away," as well as other new works from his Eden studies, at Art for the Home Gallery on Memorial Day Weekend. The artist will be at the gallery from 3 to 7 p.m. on Saturday, Sunday and Monday. Carlo's signature technique is to layer acrylic paint with varnish, layer upon layer, creating a 3-D effect. D'Alessio is well-known for his sky paintings, which use his distinctive method of layering to produce a heavenly light filtered through mist. A fabulous talent, this is one artist you will want to meet. Forming the focal points for many executive offices, premier designer homes, and fine restaurants from Aspen to Singapore, the glowing luminosity of Carlo D'Alessio's paintings is the hallmark of his signature style. D'Alessio paints with a painstaking and distinctive technique that produces a visual effect which has been compared to the work of Maxfield Parrish (1870-1966). By layering acrylic paint with varnish, layer built upon layer, D'Alessio creates a brilliant, illusionistic, three-dimensional effect that mimics changes in natural light. Over the course of his 27-year-long career as a visual artist, D'Alessio has perfected his understanding of perspective, further enhancing the illusionism in his paintings. During the Renaissance, famous masters were inspired and prospered through commissions from their wealthy patrons who felt strongly about an artistic concept but lacked the talent to create it outside of their imaginations. Similarly today, New York native Carlo D’Alessio has flourished in his long career as a commissioned artist through his ability to intuitively connect with his clients and make their dreams a reality. D’Alessio has a quiet confidence about his work, “I have had the privilege of working with some very wonderful people – sometimes, very strong people who knew exactly what they wanted from their life and from me; sometimes, gentler people who had a simple idea and let me go with it.” Carlo’s spectacular range of paintings dramatically illustrates the inspiration provided by his clients when combined with his artistic genius and vision. D'Alessio has a great sense of humor and can entertain with stories of his life and career, including his meaningful relationships with commission clients. Unlike many artists who view outside input as interfering with their creative process, it is the clients themselves that have made work so rewarding for Carlo. To illustrate his success, a powerful businessman who had owned many hotels commissioned D'Alessio to paint a long mural down a wide hallway highlighting various properties that had been important in the man’s life. “He would cancel his business meetings at the last moment, upsetting everyone, to stay at home and watch me paint. When I was to start the job, I asked if he wanted the paintings on board, which is my usual medium. He said ‘no, just paint on the walls.’ I said, ‘what if you want to move?’ He said, ‘we normally sell everything with the house when we move.’ I said ‘well what if I become famous?’ He said,‘I’ll be dead by the time you’re famous … you’ll be dead by the time you’re famous.’” The next morning when Carlo went to work, panels had been meticulously installed overnight so they could easily be removed. Born in the Bronx in 1954, D’Alessio’s artistic journey began at an early age when he was accepted into the High School of Music and Art in New York City (the movie “Fame” school). He went on to graduate from Fordham University in conjunction with New York’s School of Visual Arts and attend the renowned Art Students League. Carlo paints using a technique used by artist Maxfield Parrish. Acrylic paint is layered with varnish, then color, then varnish, until the layers create a stunning three-dimensional effect. Though the subject matter may vary, a painting by D’Alessio always draws you in, through his perfect perspective, to a transcendent world of light and color. Commissions have frequently come from restaurants where the artwork is the focal point for an elegant dining experience. Harpers Bazaar magazine made the owners of a restaurant perch precariously on the top of a booth so they could shoot Carlo’s painting “Andiamo” as the backdrop for an issue featuring Aspen restaurants. “When I was doing a painting for a lady from Texas whose ‘daddy’ was in oil, she said she needed a painting for her wall. I said, ‘how large a painting?’ She said, ‘I’m from Texas, honey – for The Wall!’” The 60 square foot painting's five panels wrapped around a sweeping staircase, celebrating a milestone passage in her life. Over the course of his long career as a visual artist, D’Alessio’s body of work includes paintings that are personally inspired; however, the magic of many works originates from the clients themselves.